Mark your calendars! If you’re in the San Diego area December 3-5, don’t miss the opportunity to see Ingram Micro’s top cloud leaders in action. Dan Shapero, Director of Global Marketing, Cloud at Ingram Micro, will join an Executive Roundtable at the 2014 Cloud Channel Summit, while Renee Bergeron, Vice President, Worldwide Cloud Computing at Ingram Micro, will head up a panel presentation at the NexGen Conference & Expo. Both industry events are collocated at the San Diego Marriott & Convention Center. 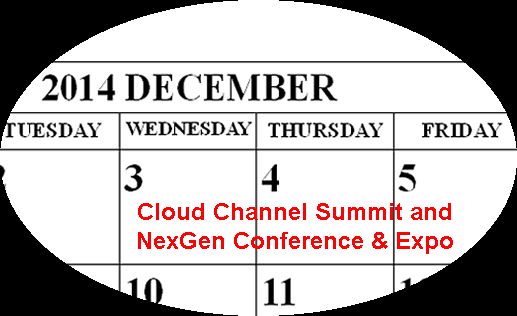 Jeff Kaplan’s strategic consulting firm THINKstrategies and the company’s service division, Cloud Computing Showplace, are teaming with the Channel Company, publisher of CRN, to collocate the 2014 Cloud Channel Summit with the NexGen Cloud Conference & Expo. The events will provide VARs, systems integrators and other channel companies with valuable information about how to build successful Cloud services. Dan Shapero will be participating in an Executive Roundtable at the Cloud Channel Summit focusing on “Future Models for Partner Success in the Cloud.” The event will be moderated by Carolyn April, Senior Director of Industry Analysis at CompTIA and will include additional panelists from Reflexion, Swift Chip, and Datto. “It’s always great to have the opportunity to share the stage with channel peers, to engage with our Cloud Community and to share insights and best practices from my years of experience working in the industry, as well as, from working with Ingram Micro channel partners,” says Shapero. Reneé Bergeron will be participating in a “Cloud Vendor Executive Panel” discussion on December 4 at the NexGen Conference & Expo. Bergeron, along with executives from IBM, ServiceNow, and Salesforce.com will discuss the Cloud’s impact on the partner ecosystem. If you’re in the area and would like to attend, you can register online here, until end of day Friday, Nov. 28. For more information on these events, check out www.cloudsummits.com and www.nexgencloudcon.com.